Last week EatingWell traveled to the White House in Washington, D.C., to celebrate the MyPlate Recipes Partnership, a new effort to make healthy recipes that meet USDA’s MyPlate guidelines easy to find and share online and on a new MyPlate Recipes Pinterest page. The effort is a partnership with First Lady Michelle Obama, her Let’s Move! initiative, the Partnership for a Healthier America, the USDA and 17 top American publishers. In a sit-down meeting in the White House’s China Room last week (pictured left), the First Lady shared her family’s dinnertime challenges. 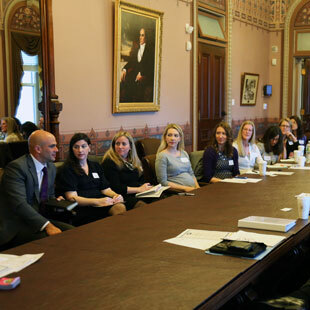 White House assistant chef Sam Kass meets with representatives from Meredith, Condé Nast, Hearst, Scripps and Time Inc., the First Lady’s Let’s Move! initiative, the Partnership for a Healthier America and the U.S. Department of Agriculture to celebrate a new effort, the MyPlate Recipes Partnership, to make healthy recipes that meet USDA’s MyPlate guidelines easy to find and share online. White House pastry chef Bill Yosses leads a tour of the White House garden, composter and beehive on the south lawn. 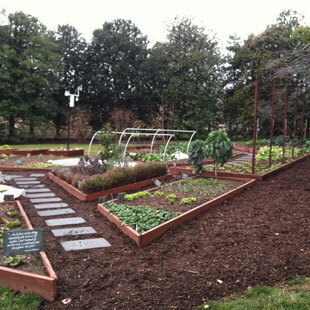 While the White House garden is not certified organic, they do use organic growing methods, Yosses said. The #1 question from visitors? Yosses said they give lots of tours to school kids and most of them ask if they can taste what’s growing. In the summertime, Yosses said Sam Kass always prepares something from the garden for the First Family’s table. Any crops they cannot use fresh are either pickled or donated to local shelters. The White House raised-bed garden is small, neat and tidy and features heirloom seeds from Thomas Jefferson’s 1,000-foot garden at Monticello—and a fig tree—among other vegetables. White House executive chef Cristeta Comerford leads a tour of the White House kitchen, which is surprisingly small in size considering it houses the cooking for state dinners and White House events.